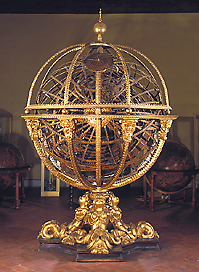 This enormous armillary sphere, more than 3 metres in height, was begun on 4 March 1588 and completed on 6 May 1593. It was constructed on the commission of Ferdinando I by his 'master of the Sphere', Antonio Santucci di Pomarance. At the centre of the sphere is the terrestrial globe, surrounded by seven planetary spheres and a sphere of the fixed stars bearing the zodiac band. To these eight mobile spheres is added a ninth, known as the Primum mobile, which is fixed and bears the polar caps and the meridians of metal wire. The Medici-Lorraine arms adorn the inner surface of the two caps (Ferdinando I was married to Christine of Lorraine). The movement of the machine was made possible by a handle which rotated an axle passing through the earth.